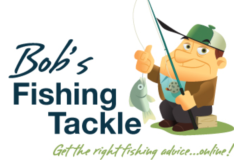 Here at Bob’s Fishing Tackle we’re creating a new concept in online fishing tackle stores. If you’re not sure what fishing gear you need for a particular situation, whether it be fishing rods, fishing reels, fishing lures or the like, then email or phone one of Bob’s helpful staff. We’re fishermen ourselves and get out there regularly trying to catch the same fish as you so we can understand the problems you have. There’s nothing more frustrating than going to some great fishing spot and not having the right gear. Don’t let your next trip turn into a disaster with the one that got away. Just because we’re an online business, doesn’t mean you don’t deserve the best personalised service from our friendly crew. Whatever kind of advice you need, we can help and if we can’t help you immediately, we’ll find out and get back to you pretty quick smart. That’s part of what makes shopping with Bob’s Fishing Tackle a different online experience that you’re sure to tell your mates about. Send us Your Fishing Photos! When you catch that next whopper, send us your photos, videos and success stories too. We’d love to hear what you’ve been up to and even maybe feature them on our website or Facebook page. Share and show off your next catch to our community of fishing lovers just like yourself.